Meet Chopper, oh and that is Mongo the Gorilla that is giving him the right hand punch. Chopper is a little over 6 months old, he's half sheltie and half american eskimo. We got him last November, he was just so darn cute! Besides his boxing matches he loves to play in the snow and run as fast as he can on carpet. He's also big on fetch with any of his numerous toys. What a cute little fighter. Looks like Mongo might be losing the fight. Chopper looks like he is ready to play! Cute puppy, cute photo! I can tell he has LOTS of energy. Chopper is a doll. 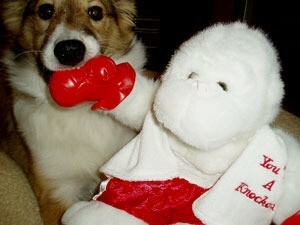 I have had a sheltie/american eskimo mix dog, Kodie, for 5 years. I got him when he was 8 weeks old. He looks a lot like Chopper. He is the most loving, good natured, cute dog. Barks a bit too much though, but very gentle. Should something ever happen to him I would want to get another of the same mix, but fear there is no place that breeds them. That they were just "accidents". 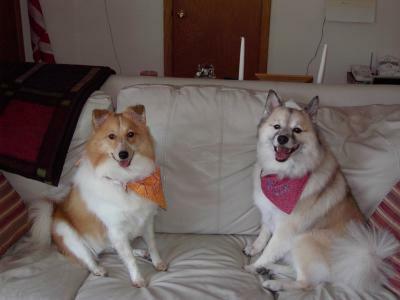 Do you know of anyone who breads the american eskimo/shelties??? Cute! Where did you get the dog? I'm interested in getting one. I just brought home a sheltie/Eskimo mix. His name is Bailey and he is a tan/black/brown mix with a white collar and legs. He is the sweetest, cutest, smartest dog I've ever known!! He curls up and sleeps wherever we are and waits for us during walks if we stop! It's been two days and he already knows that peeing outside is good! I'm in love! It's great to see other little cuties out there! I am also interested in finding this breed of dog. A friend of mine had this mix and would love to get another. I have a Sheltie/American Eskimo mix too. Her name is Molly. Here's her picture. She's the one on the left. Our other dog is her uncle Max (really, he is her uncle). He is a Keeshond/American Eskimo mix. I have an American Eskimo/Keeshond mix and looks identical to yours. That is the only picture I could find of one on the Internet. Amazing dog, he is so intelligent and loving.